On a perfect July 2017 evening, 100 or so people are convened in the visitors center of the Lower East Side Tenement Museum in Manhattan. The purpose of the gathering is twofold: to honor the museum’s outgoing president, Morris Vogel, and outgoing executive vice president, Barry Roseman; and to celebrate its newest exhibit, “Under One Roof,” which chronicles the lives of three families who once lived in this building, 103 Orchard Street, acquired by the museum in 2007. The exhibit meticulously restores, re-creates, and interprets a tenement apartment, populating it with memories and artifacts from the lives of the Epsteins, Jewish refugees from Nazi-occupied Poland; the Saez Velez family, Puerto Rican migrants; and the Wongs, immigrants from China. An adjacent gallery space depicts a garment factory representative of those in the neighborhood in the 20th century. “Under One Roof” isn’t a straight work of architectural preservation—rather, it is both a reversion and a reinvention, preserving a space in order to preserve the stories of the people who once occupied it, as a way of telling the story of America. Each speech at the Tenement Museum event leaves attendees more dewy-eyed than the last, not only because Vogel and Roseman are beloved, but also because of the subject matter. Immigration is the heartbeat of the Tenement Museum; this National Trust Historic Site is dedicated to telling the stories of those who passed through its halls in search of better lives. As Vogel notes in his own speech, “The museum is about the people and families who followed their dreams to this country and this city, and struggled in often difficult circumstances to earn livelihoods, to raise families, and to establish communities.” Among the crowd are members of the Epstein, Saez Velez, and Wong families. It took a good 10 years, hundreds of hours of interviews, an extensive architectural adventure, and the support of families and neighborhood residents, but finally visitors are able to experience that common ground at 103 Orchard for themselves. 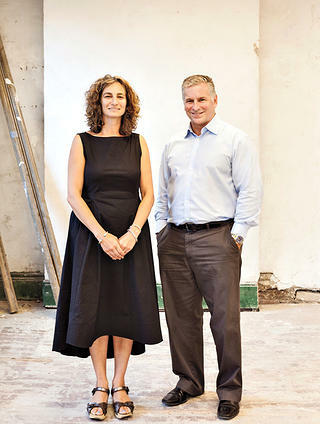 Annie Polland, executive vice president for programs and interpretation at the Tenement Museum, and Kevin Jennings, the museum’s new president. Historians Ruth Abram and Anita Jacobson co-founded the Lower East Side Tenement Museum in 1988 to honor, preserve, and interpret the stories of the hundreds of thousands of immigrants to the neighborhood that was, at the turn of the 20th century, the country’s most densely populated area. They began with educational programs and walking tours, and in the mid-1990s they purchased a former tenement building at 97 Orchard Street. It had housed nearly 7,000 people between its construction in 1863 and its conversion to a commercial building in 1935. There they restored the apartments of seven families, including Irish, Italian, German, and Eastern European–Jewish immigrants. Visitors got an immersive, experiential window into the residents’ lives, as educators gave interactive tours. The museum became both a National Historic Site and a National Trust Historic Site in 1998. But because 97 Orchard wasn’t residential after 1935, there were no post–World War II occupants whose histories the museum could mine. “We haven’t been able to tell the stories of more recent arrivals to the neighborhood,” Polland says. Yet there were so many. President Harry S. Truman issued an executive order in 1945 that allowed victims of Nazi persecution and those displaced during the war easier entry into the United States, as did the 1948 and 1950 Displaced Persons acts. Almost 700,000 Puerto Rican migrants streamed into the continental United States by 1955, and immigration surged after President Lyndon B. Johnson signed the Hart-Celler Act in 1965, ending quotas based on national origin. By 1960, the Lower East Side was 26 percent Puerto Rican and 7 percent African American; by 1970 it was 11 percent Chinese. Outside 103 Orchard, life continues to move at a 21st-century pace. In late 2006, a building three doors down from the Tenement Museum, at 103 Orchard, went up for sale. The museum bought this structure in January 2007. 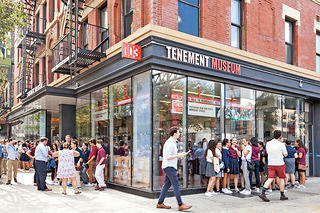 With the help of multimillion-dollar capital campaigns, it stabilized the foundation; transformed the first and second floors into a visitors center, gift shop, and classrooms; added office space and a new roof; and, finally, preserved a 1,000-square-foot tenement apartment that would showcase the lives of these newer residents. This one, however, would take a more integrated approach than the seven separate apartments at 97 Orchard. “We’re interpreting and restoring a single apartment, but we’re using that single apartment to tell three family stories from the 1950s through the 1970s,” says David Favaloro, the museum’s director of curatorial affairs. Before Favaloro and his colleagues could restore, re-create, and reinvent the apartment, they had to ensure that the structure was safe. This was no easy task: The building had an unusual and confounding architectural history, which museum staff and interns discovered by sifting through blueprints, permits, fire insurance maps, and other records from the city’s Department of Buildings. Originally, what is now 103 Orchard was three separate “dumbbell tenements”—25-foot-wide buildings with airshafts carved on either side—all erected in 1888. In 1903, to make way for the onramp to the Williamsburg Bridge, the city of New York demolished the four buildings that stood between 103 Orchard and the widened thoroughfare of Delancey Street. Suddenly, 103 was on the corner. “What was the side of a building that wasn’t meant to be seen became the facade,” says Polland. This required some reconfiguration, including the addition of windows and the relocation of stairwells. In 1913, the owner of the three buildings, financier Joseph Marcus, chopped off the back of them and added on a bank building. He then “fused together the front half to create one new building made out of the constituent parts of the other tenement,” says Polland. In the Wong family section of the apartment, the girls’ 1970s bedroom is furnished with flowered bedspreads and a checkered linoleum floor. Leahy and his team reconfigured an older staircase, using the original iron railing as a prototype. They whacked out load-bearing walls and added steel beams (which had to be cut in half and dropped in from above) for structural reinforcement. They performed asbestos abatement and facade repair, added a new roof and new mechanicals, and extended the elevator shaft, among many other tasks. They set about creating offices in the basement, the visitors center on the first floor, and classrooms on the second floor. Then, in 2016, they began construction on the apartment, even as people shopped and signed up for tours below. A photo of Kalman and Rivka Epstein graces the dining room wall in the 1950s section of the apartment. 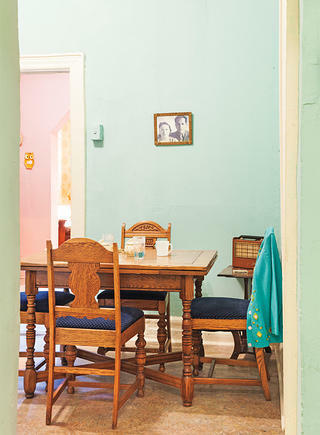 Furnishings curator Pamela Keech found period-appropriate appliances and foods for the re-created Saez Velez family kitchen. Restoring the apartment required real detective work; Leahy compares Polland and Favaloro’s investigative, detailed approach to the television show CSI. “The architectural research is as important as the research we do about the social history of the people and families [who occupied] the spaces we’re interpreting,” says Favaloro. “We knew that a wall was moved, making one bedroom smaller and another larger, so we returned that to its period-appropriate location.” They decided to expose anything new they added, including a sprinkler system and heating and air-conditioning ducts. While Leahy and his team were at work on the structure, Polland, Favaloro, and their team were deep in research—not just about the building, but also about the families who lived in it, to find them and enlist their help in re-creating the spaces. They used census records and reverse phone directories to get a sense of who and how many people lived there, and interviewed many other longtime Lower East Side residents, who helped paint a picture of local daily life. Eventually they tracked down the Epstein, Saez Velez, and Wong families. Polland and her colleagues conducted extensive oral-history interviews with them starting in 2011. The interviewees provided detailed information about what the spaces looked like, sharing photographs and donating their own clothes and decor from their time there. Once the apartment was furnished, it triggered more memories from the Saez Velez family, so the interviews are ongoing. The exhibit starts in the hallway outside the apartment, with a soundscape that evokes the neighborhood in the 1950s: voices speaking in Italian and Yiddish. 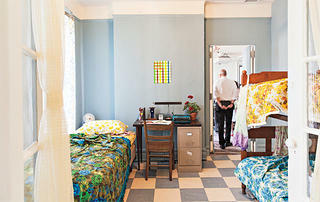 Then visitors enter the apartment, into a bedroom and dining room representing the Epsteins, who were some of the earliest World War II refugees allowed into the United States. Kalman and Rivka Epstein moved to 103 Orchard in 1956 with their American-born daughter, Bella. To Bella, becoming American meant snacking on sugar cane proffered by Puerto Rican vendors, and listening to Yiddish, Spanish, English, and Italian echoing in the airshaft. The family had the building’s first television set, which brought neighbors from all backgrounds into their apartment. A flowered bedspread covers her bed in a small, blush-pink bedroom. On the dining room table sits a pack of vintage Old Gold cigarettes and a Zippo lighter, as they did decades ago. 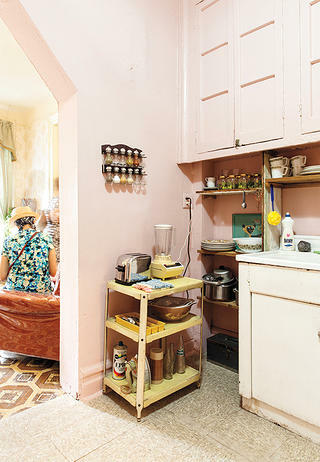 From the Epsteins’ dining room, visitors time-travel to a representation of Ramonita Rivera Saez’s 1960s kitchen. Saez came with her two sons to New York in 1955, moving to the building after her boys, Andy and Jose Velez, heard from an Italian friend about a vacancy there. Saez worked long hours in a garment factory—the museum’s website includes a picture of her Local 23 union card—and prepared elaborate meals for friends and family on the weekends, which is partly why organizers chose the kitchen to represent her family’s time there. Jose became, at the tender age of 15, the building’s superintendent. 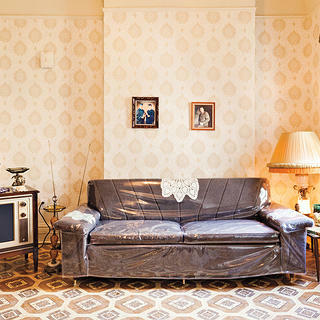 In the living room, a plastic-covered couch, with doilies draped over the back and arms, sits atop period-appropriate linoleum that looks much like the floorcovering in the Saez Velez family’s photos. Ramonita Rivera Saez in the 1960s. A picture of Jose and Andy graduating from high school hangs on the wall. Andy donated his toolbox and his 1960s second-place Boy Scout of the Year award. There’s a sewing box, a rosary, a decorative plate with an image of Pope Paul VI: the artifacts of a proud and devout family. 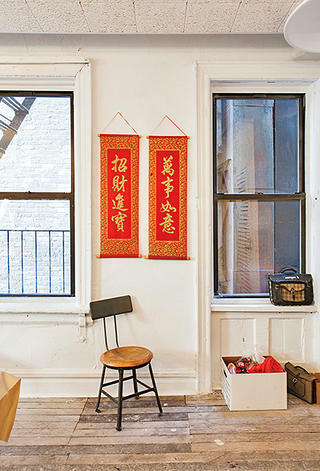 The back bedroom depicts the late-1970s apartment of the Wongs. The floor is covered in a blue-and-white checkered linoleum, with blue walls, a small desk, and one single bed plus a bunk bed, for the Wongs’ three daughters. (Their son shared the parents’ bedroom, which has not been interpreted.) From there, a door opens into a gallery space that the museum has used to replicate a local garment factory—not because the building ever had one, but because they were so integral to the lives of the refugees, migrants, and immigrants who settled on the Lower East Side. Like Ramonita Saez, Mrs. Wong worked long and hard hours sewing in these factories. In the early 1980s, there were more than 400 in the neighborhood, but today fewer than 10 remain. The garment factory, like the other spaces, contains various multimedia elements. Touching one of the six sewing machines sets off a video of interviews with the Wongs and former garment workers, projected onto fabric. A payphone dials up audio of Mrs. Wong and the Wong children, now grown, speaking about their experiences. 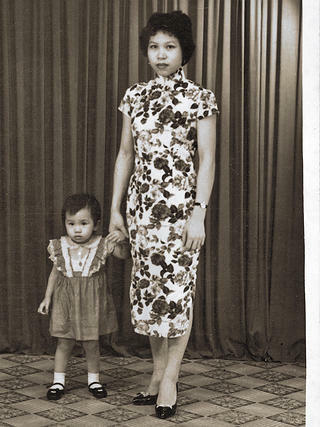 Mrs. Wong and her daughter Yat Ping. 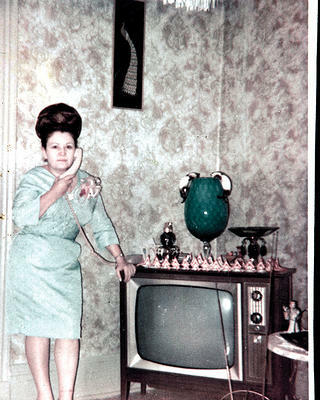 The 1960s-era television in the apartment’s living room plays videos of members of the Saez Velez family recounting their memories. Throughout, modern technology transports visitors to the recent past and unifies the three narratives, the stories that show what these diverse refugee, migrant, and immigrant families have in common. Those stories, of course, are still being written, with narratives unfolding in new directions every day. The question of immigration’s future hangs in the balance, but so does the question of the neighborhood’s future. There are now far more hipster bars and swanky restaurants than garment factories. On the night of the unveiling, a line of clubgoers with rainbow hair colors and tight black clothes snakes from Delancey Street around the corner to Orchard, as they wait to slink past a nightclub’s velvet ropes. Lisa Selin Davis is a New York–based journalist and novelist. Her work has appeared in The New York Times, The Wall Street Journal, and The Guardian. Celebrate American Women QUIZ: Which Historic Woman Are You?